Turramurra Fresh Produce and Gourmet Martket is a weekly fresh produce market located on the North Shore of Sydney. It is supported by local stallholders and members of the community and therefor needed a logo and identity to appeal to the locals. 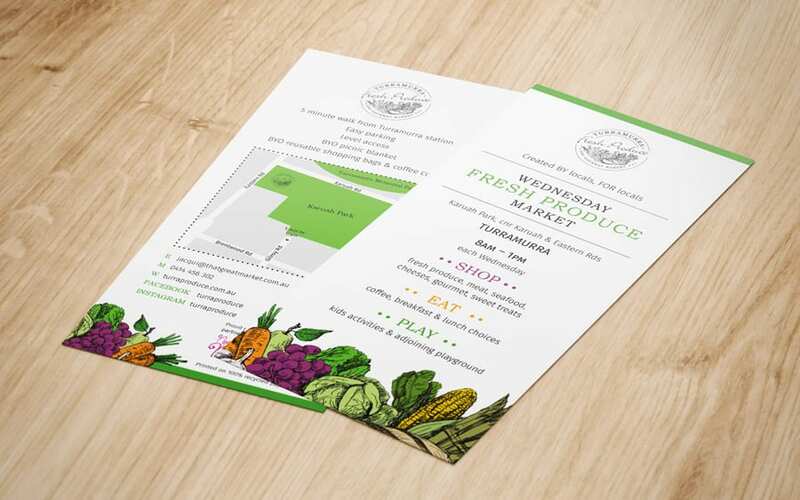 Merie impressed me right from the start, when she developed a range of fabulous logo designs for our produce market, after only a 1 hour brief. I easily picked the favourite which we only had to tweak a little, then from that, Merie produced the most stylish DL flyer I could ever have hoped for. She has created an image for our market that speaks of quality with a very wholesome feel – which is exactly what I wanted. Nothing is too hard for her and she treats all requests with intelligence and thoughtfulness. I look forward to continuing to work with Merie for many years!